Have you ever stood in an art gallery, and been so entranced by a painting, time standing still as you stared into its depths, imagining the lives of the people depicted in the gorgeous landscape, wondering what brought them there, and how they knew each other? 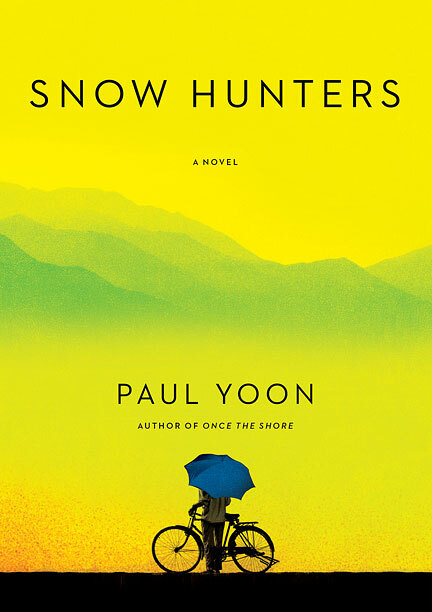 That is the sense you get when reading Snow Hunters, Paul Yoon’s second novel after the award winning Once the Shore. You are gazing into the depths of a painting as you read, time politely waiting for you to finish. The book centers on a North Korean defector, Yohan, and his life as he makes a new home for himself in Brazil, after the war that tore his country – and his life – apart. As Yohan deals with the new culture and language, the trauma he suffered as a soldier in the war still clings tight to his mind, making it difficult for him to form bonds with the people he meets; yet each character who comes into his life will have a deep impact on his world. The few people who impact his life are very important to him; Kiyoshi, the tailor of little words, for whom Yohan works when he moves to Brazil, who helps him refine a trade and make a place for himself in this new world; Peixie, the groundskeeper at the local church, a loyal friend; and the children Santi and Bia, whom he watches growing up, and is strongly attached to. He must learn to let go of his past, so that he may forge new relationships with them. The flashbacks to Yohan’s life before, during, and after the war, his life in the prison camps while trying to heal Peng, reflect the deep scars that still affect Yohan’s present. Time jostles back and forth, juxtaposing past and present, a reflection of just how present the trauma actually is. Many flashbacks occur suddenly, the present becoming past without a moment’s notice: Yohan is incapable of forgetting, his PTSD unspoken but present. This is the main theme of the short novel: moving on, healing, and change, and how necessary they are for growth. It is a quiet novel: you get the sense that you are watching a long exposure of someone’s life, seeing the characters weave in and out of the fabric and leaving their marks. Yohan does not speak much, and is incredibly solitary, becoming more so when he defects, lost in the many foreign languages and culture shock. Though quiet, the novel is in no way slow; the action is fluid, moving from present to memory and back again, and in the capacity of the author to create such complete views into Yohan’s world brings life to even the smallest passage. Quiet is in no way a negative connotation when it comes to Snow Hunters. This is a remarkable novel. While I am not the kind who usually enjoys historical fiction, there’s no denying that the beauty of Yoon’s writing won me over. Reading the book was a cathartic experience, a quiet testament to the slow healing of time. It is, in all way shapes and forms, a work of art. I highly recommend it.